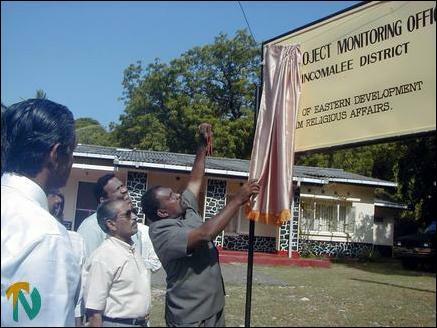 The Trincomalee SIRUP Project Monitoring Office has been established under the Eastern Regional Development Ministry, which comes under Mr.Rauff Hakeem, who is also the Minister of Port, Shipping and Muslim Religious Affairs, district secretariat sources said. Tamil National Alliance parliamentarian Mr.K.Thurairetnasingham also attended the event. Trincomalee Government Agent Mr. Gamini Rodrigo and several Divisional Secretaries in the district and heads of government departments participated in the event. The Prime Minister has appointed three parliamentarians of the district, Messrs K.M.Thowfeek (SLMC), Mr.M.A.M.Maharoof (UNP) and Mr.M.S.Thowfeek (SLMC), all of whom are members of the ruling United National Front government, to monitor all development works in the district. However only Mr.K.M.Thowfeek was present at the occasion and the other two MPs did not attend the function. Mr. Maharoof was represented by his private secretary Mr.M.I.M.Mustapha. Parliamentarian Mr.K.M.Thowfeek signing the record at the auspicious time in the newly opened SIRUP Monitoring Office in Trincomalee in his office room. 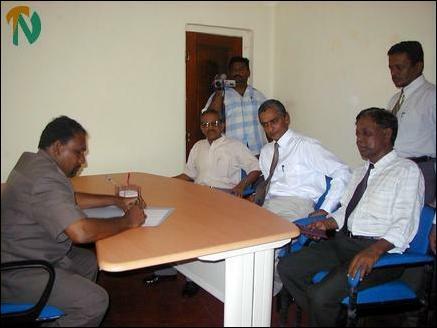 Seated in front of him ( L-R) TNA parliamentarian Mr.Thurairetnasingham, Government Agent Mr.Gamini Rodrigo and Deputy Director of Planning Mr.V.Suntheralingam. The role of the parliamentarians is to focus their attention mainly on supervision and co-ordination, identification of issues with regard to the implementation of the projects, assist the implementing agencies on such issues and to ensure timely completion of proposed projects. The objective of the SIRUP project is to contribute to the improvement of basic conditions for living and socio-economic activities, upgrading of small-scale pro-poor infrastructure such as water supply, sanitation, irrigation, roads and bridges, and infrastructure for education. In the year 2004, one hundred million rupees are to be allocated for the development of education and 120 million rupees for the health sector, the Government Agent, Mr. Gamini Rodrigo, said at the event. Parliamentarians, government agent and other officials observing a religious rite.